Macrovascular complications of diabetes like cardiovascular diseases appear to be one of the leading causes of mortality. Current therapies aimed at counteracting the adverse effects of diabetes on cardiovascular system are found to be inadequate. Hence, there is a growing need in search of novel targets. Adenosine Monophosphate Activated Protein Kinase (AMPK) is one such promising target, as a plethora of evidences pointing to its cardioprotective role in pathological milieu like cardiac hypertrophy, atherosclerosis and heart failure. AMPK is a serine-threonine kinase, which gets activated in response to a cellular depriving energy status. It orchestrates cellular metabolic response to energy demand and is, therefore, often referred to as “metabolic master switch” of the cell. 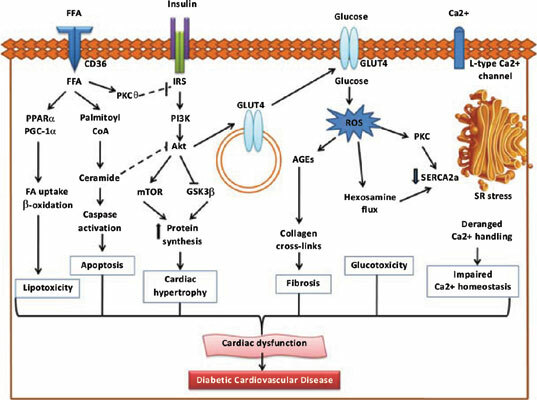 In this review, we provide an overview of patho-mechanisms of diabetic cardiovascular disease; highlighting the role of AMPK in the regulation of this condition, followed by a description of extrinsic modulators of AMPK as potential therapeutic tools. AMPK, diabetes, diabetic complications, cardiomyopathy, cardiovascular disease, atherosclerosis.